One group of our CSA members (they collectively share one box) does something really cool. They use the ingredients in their box to cook a big meal together every Sunday. 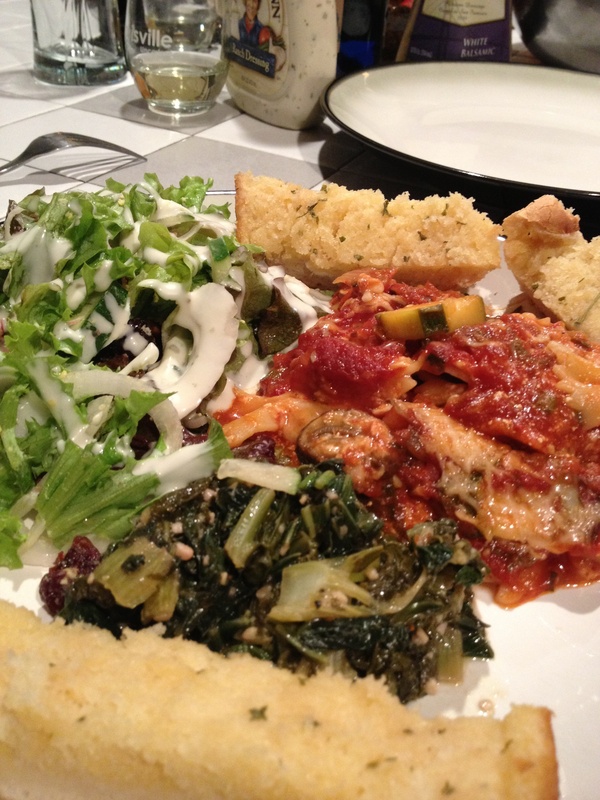 This week, it looks like a yummy veg lasagna, salad, and cooked greens. And, truly, what meal is complete without cornbread and excellent libations? Thanks, fellas, for sharing your creations (even if just in picture form) from your first CSA box! We’re in a very green-things heavy time of the year. You will start to wonder, sooner or later, how to use all of these greens before you run out of ideas or they start to spoil. First of all, ENJOY IT! You’ve gone all winter without FRESH, FROM-THE-GROUND, you-can-still-kinda-taste-the-dirt crunchy green food! Secondly, we’ve always said that the most likely way to have success is to try out one new recipe every week and otherwise incorporate the veg into whatever you’re already doing in your household. 1 bunch radishes sliced into thin chips. mix together last 3 ingredients and pour over first 2 ingredients. Put into an airtight, nonreactive container in the fridge. Taste and enjoy after waiting at least 1 day! Use the salad mix, leeks, and any of the other greens as a fresh addition to your tacos, omelets, sandwiches. Try new toppings to your salads: feta, goat cheese, parmesan. Apples, pears, cranberries. Chicken, nuts, artichoke hearts, sunflower seeds. Try making more robust wraps out of the chard or kale. Now, all those greens. The pac choi, the swiss chard, and kale. See our fav Pac Choi Cole Slaw recipe in the “recipes” section. All of these greens are candidates for cooking in a skillet with some onion, garlic, salt and pepper. Don’t overcook the chard – I find it’s best when it’s still got some bright green and toothiness (a word I made up for how it feels in my mouth – aka your teeth enjoy biting through it). Add kale to your smoothies and baked goods! Cannellini Beans and Kale – this recipe calls for Lacinato kale, which we grow, too. But this week you have young Winterbor leaves, a curlier variety. Kale Chips – Winterbor is a great variety for this. They take hardly any time at all and they are sooooooooooooooooo good. When I pull them out of the oven they’re gone in like .459 seconds. That is fast, people. Even baby Hugo loves them! I use bacon grease instead of a fancy oil. I imagine coconut oil (google how awesome coconut oil is and then put some in your pantry) would also be super delish. Pac Choi stir fry – this recipe calls for Tamari, which is a special soy sauce that I’ve never heard of. If you want to use a special soy sauce, go for it. Did you know there’s a locally-made small-batch soy sauce here in Louisville? There is. Bluegrass Soy Sauce. 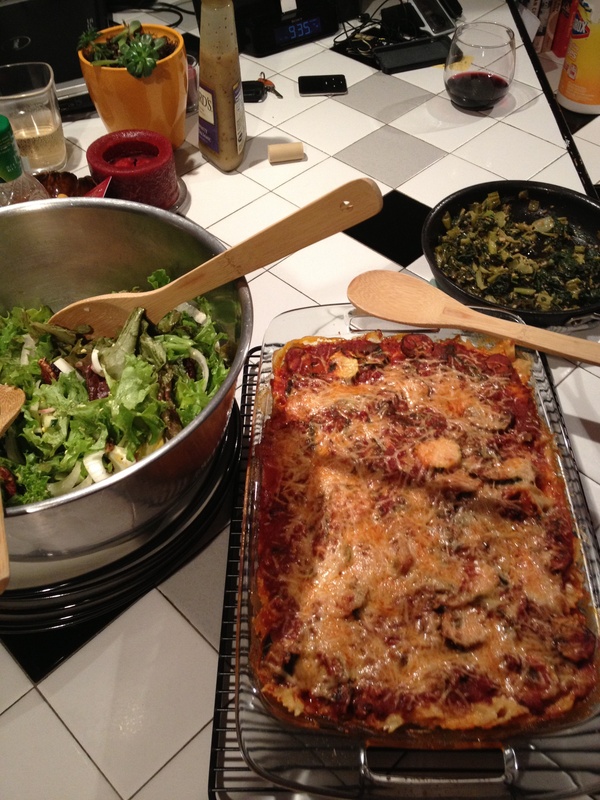 Swiss Chard quiche – I don’t have the patience for pie crust, so I use (gasp!) store-bought. The thing about quiches, is that once you figure out what egg:cheese:cream ratio suits you, you can toss anything in there. Throw your diced baby leeks in there, too. Roasted Baby Leeks – simple and rustic side dish.